Although never exactly a pinball wizard, I enjoyed the occasional bouncing of a steel ball around the table when I was young. So when asked by my kids what pinball was, I went looking for a modern version on the iPhone. Going Tilt: Wild West Pinball offers a pretty faithful recreation of the pinball machine experience on your iPhone. Wild West Pinball by OOO Gameprom looked pretty good, so I downloaded the $1 game and fired it up for the kids. They didn’t hear from me for over an hour. Recreating the gameplay experience of pinball is simple enough—you launch the ball and hit it with flippers just like you would with a pinball machine. Wild West Pinball lets you work the flippers by tapping virtually anywhere on the sides of the iPhone screen, so you can easily find a comfortable playing position. That’s an important feature because the game allows the player to move the iPhone itself to simulate “tilting” the table. Because of that, I usually wind up writhing and twisting as I play the game to get the ball to do what I want—it must be hilarious for onlookers. The app uses a moving camera view to follow the action of the ball, zooming in to where it rolls to give you a closer look at the action—closer, even, than if the game took place on a static table. Wild West Pinball follows the ball just like you would with your eye, and with an impressive 40 frames-per-second of 3-D graphics, it looks amazing. The sounds are realistic, and the physics of the ball movement are nearly flawless, making for an engrossing playing experience. Perhaps a little too engrossing—this is the first iPhone game where I’ve been tempted to throw the mobile device when I lose. Certainly a more complex table, with more bumpers and bells and whistles would be even more fun, but this game has plenty to keep you coming back. I know Wild West Pinball will be keeping my attention for some time. 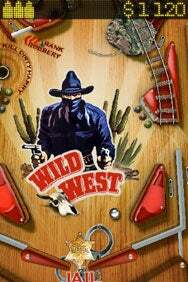 Wild West Pinball is compatible with any iPhone or iPod touch running the iPhone 2.1 software update.